Boxcopy is an artist-run contemporary art space dedicated to creating a platform for the experimental and innovative practices of Australian artists. We support artists to develop and present new works in a critical context, through our program of exhibitions, events, publications and discussions. Boxcopy presents a curated program of exhibitions by early career and more established artists, who work across diverse media including moving image, sound, performance and installation. As an artist-run initiative we embrace experimentation, collaborative processes and a d.i.y. approach to contemporary art practice. Coming up to our ten year anniversary in 2017, Boxcopy is one of the longest running artist run spaces in Brisbane. Boxcopy was founded as a collaborative project by seven art school graduates in 2007, initially operating from the basement of a Queenslander house in New Farm. In 2008 Boxcopy was selected as the inaugural ARI-in-Residence at Metro Arts. 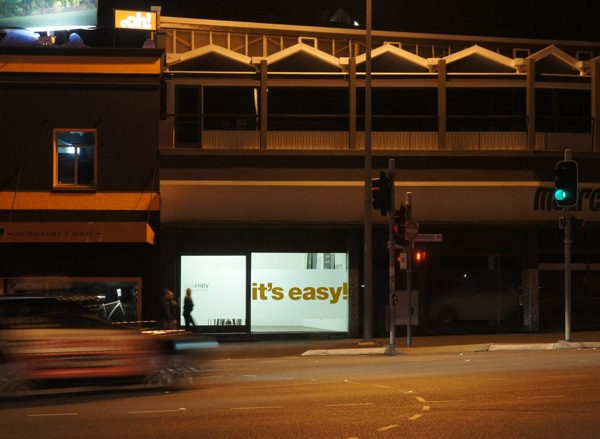 The gallery was established in the historical Watson Brothers Building in Brisbane’s CBD in 2009 until relocating to our current space at the Normanby Fiveways, on Petrie Terrace in 2013.